The tobacco giant has had its ups and downs. What's next for Philip Morris International? Philip Morris International (NYSE:PM) has a relatively short history that dates back to its 2008 IPO. Yet along the way, the seller of Marlboro cigarettes worldwide has seen its stock perform extremely well, producing a total return of more than 170% since coming public. Yet after a huge run-up in the early 2010s, the tobacco giant's stock has stalled out, and some fear trouble ahead that could hold back Philip Morris in the future. Will the company keep producing good returns for shareholders in the years to come? Below, we'll look more closely at what got Philip Morris International to where it is now and what's coming down the road for the global tobacco company. The timing of Philip Morris International's IPO was unfortunate in some respects, as it came immediately before the financial crisis and recession of 2008, which hurt stocks almost across the board. Yet it didn't take long for Philip Morris to regain its lost ground from the crisis, and by mid-2010, the tobacco giant had begun an upward move that would lead to a doubling in its share price in less than two years. The popularity of Philip Morris stock came largely from strong fundamental performance and favorable prospects. The decision to separate the internationally oriented company from its former domestic parent came largely to give investors the opportunity to benefit from faster growth trends overseas. Moreover, regulators in foreign countries were still playing catch-up to what cigarette manufacturers in the U.S. market had faced for years. Investors liked the idea of being able to do business in jurisdictions with less regulation and less onerous damage awards when litigation was successful. Dividend growth also made Philip Morris attractive to income investors. From 2008 to 2013, Philip Morris' quarterly dividend more than doubled, with four consecutive years of double-digit percentage payout increases following the end of the financial crisis. On the whole, foreign markets treated the tobacco giant well, and it outperformed its domestic counterparts. 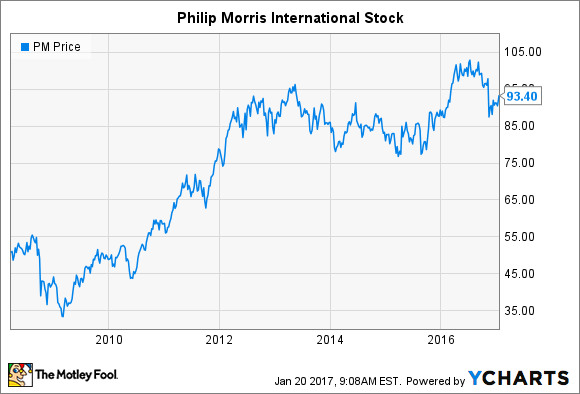 What made Philip Morris International stock stall out? Over the past several years, however, Philip Morris' big gains have given way to more sluggish performance. Many of the factors that had been extremely favorable to the international tobacco company either disappeared or reversed and became more unfriendly. The strength of the U.S. dollar had the clearest and largest effect on Philip Morris International's fundamental business. As a U.S.-based company, Philip Morris reports its results in dollars, but it collects sales and makes profits in foreign currency terms. Major foreign currencies plunged against the U.S. dollar for an extended period of time, as the U.S. economy consistently outperformed many of its most important trading partners in Europe and Asia. The net result was billions of dollars less in revenue and massive reductions in earnings per share that flattened out Philip Morris' longer-term growth trend. The secondary effects of the dollar's gains also affected investor sentiment. Double-digit percentage dividend increases gave way to more modest hikes, and Philip Morris limited dividend growth to just $0.02 per share, or roughly 2%, in both 2015 and 2016. Finally, increased regulation has hit many foreign tobacco markets. Between plain-packaging laws, bans on smoking in certain places, and consumer advocacy campaigns designed to highlight the health impacts of smoking, Philip Morris now deals with the same scrutiny that U.S.-based tobacco companies have faced for decades. Looking forward, Philip Morris is at a crossroads. On one hand, fundamental growth has remained fairly solid on an organic basis, when you disregard the impacts of currency and other extraordinary factors. Yet although dollar strengthening has slowed, it hasn't entirely disappeared, and further pressure on foreign currencies could wipe out expected earnings gains for 2017. Similarly, regulatory efforts will likely intensify, and a lot depends on whether Philip Morris and its peers can fend off the worst of any future proposals. Moreover, Philip Morris has benefited from low interest rates, but an increase on that front could make the stock less attractive to income investors. A hefty yield of 4.5% puts Philip Morris among the top blue-chip dividend stocks, but rising rates would give investors an alternative way to reap the income they need. Philip Morris International has been good to investors in the past, but the future remains uncertain. Despite having a solid foundation with its popular products, Philip Morris is still vulnerable to changing industry conditions going forward.